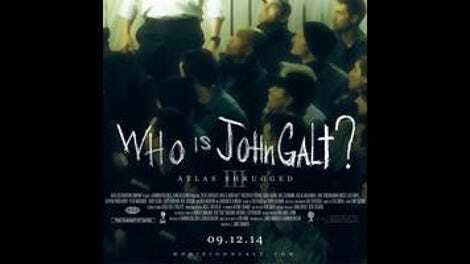 Atlas Shrugged, Part III: Who Is John Galt? 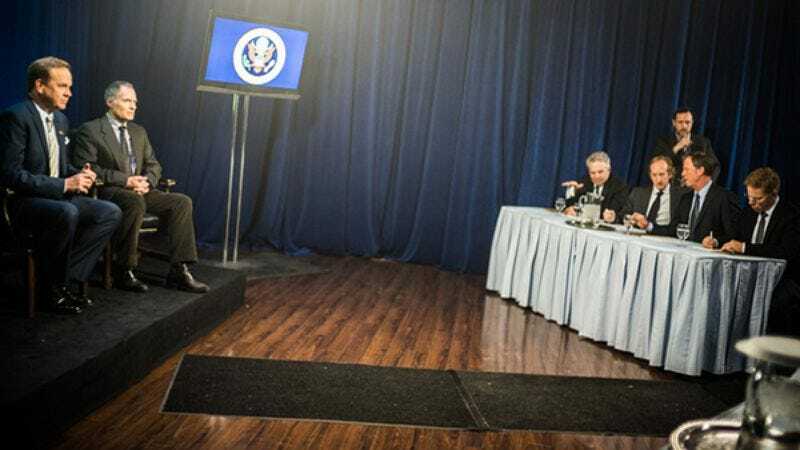 The final installment of producer John Aglialoro’s three-part adaptation of Ayn Rand’s Atlas Shrugged is prime Mystery Science Theater 3000 fodder, cut-rate to the point of incoherence. Composed in large part of stock footage and stock photos overlaid with text and narration, it’s a movie where everything, from the sets to the cast and crew, is an unconvincing, low-cost substitute for something else. Rand’s kooky, purple imagination—with its eroticized elitism and its fixation on trains, skyscrapers, and other idealized symbols of phallic power—is here reduced to strained representations. A flight is two people getting into a plane and then getting off at the same spot at the same airstrip; a plan for a top-secret weapon is a printout of a court decision tucked into a manila folder; a futuristic power source is a light emanating from behind a half-closed door; a three-hour speech is a man talking to the camera for a couple of minutes—and so on and so forth. The world seems to consist of a hotel lobby and a dozen rooms, two of which may actually be the same high-school gymnasium with different curtains hung over the back wall. People talk like malfunctioning robots trying to pass for human. (Sample exchange: “I’m Dr. Hendricks!” “The neurosurgeon! ?” “Yes, but here in the valley I practice other medicines as well!”) They introduce themselves by their last names, and then blurt out things like, “I never intended for you to occupy this room” and, “You’ve nationalized the railroad.” Phone calls are made without dialing, women with injured legs walk in heels through the woods, and sub-SeaQuest effects are used to depict a plane crash. On the soundtrack, stilted line deliveries hang over short, hypnotic loops of ambient noise. It’s so Z-grade incompetent and inadvertently absurd that quibbling with its ideology seems like unnecessary snark. Rand’s inextricably atheist, fetishistic brand of libertarianism is popular with a certain subset of the socially conservative, religious American right—which seems paradoxical if one doesn’t take into account the fact that Atlas Shrugged shares most of its beats with Rapture fiction. Here, the true believers, self-interested geniuses and industrialists, disappear one by one, whisked away to an anarcho-capitalist heaven called Galt’s Gulch, while the rabble collapse into the bad kind of anarchy—the kind brought on by unions, governments, and nationalized railroads. Revelations come from the mouth of Christ figure John Galt (who actually gets crucified by government thugs in this movie), the brilliant son of a common car mechanic. Aglialoro rushed the first installment in part so he could hold onto the rights to Rand’s novel, which were due to revert in 2010; after that production flopped, he was forced to make Atlas Shrugged, Part II: The Strike with a new, cheaper cast and an even tighter budget. That movie grossed even less than the first one, which explains why Part III has an even less notable cast and was made on a budget so low the production had to license its shots of trains, cities, and landscapes from elsewhere. (Much of this footage is quite old, and sourced from bleary standard-definition tapes.) Heroine Dagny Taggart, played by Taylor Schilling in Part I and Samantha Mathis in Part II, is now played by Laura Regan, best known for her half-dozen appearances as Harry Crane’s wife in early-season episodes of Mad Men. Actually, much of Part III’s cast has previously appeared on Mad Men; the resulting impression is that bit characters from the Sterling-Cooperverse (Duck Phillips, next-door neighbor Francine’s philandering husband, one of the PP&L bigwigs, etc.) have traveled into their version of the 21st century, where America still depends on rail travel and industry. Part of the ludicrousness of the Atlas Shrugged films stems from the fact that they cling to Rand’s plotting, which is in turn rooted in a fanciful conception of early American capitalism; they are set in a near future that runs according to the rules of the distant past. This is a world where a copper wire shortage robs America of electricity, and where the whole country is fed by wheat produced in Minnesota. (“Copper wire” and “Minnesota wheat” are uttered about a dozen times apiece in the film, as though they were trigger words meant to activate some libertarian cell.) Like its source material, Part III is a polemical work, where characters matter only insofar as they embody ideas and ideals; the problem is that it’s a screed about capitalism and government that seems to have no clue as to how either works. This is, however, also a problem of the source material. Director/co-writer James Manera—whose resume consists of an episode of Nash Bridges and a TV special hosted by Kevin Spacey—seems focused on getting through each scene as quickly and cheaply as possible. Having cut down Rand’s notoriously long-winded arguments to nonsensical soundbites—some of which are extrapolated upon by Glenn Beck and Ron Paul, who cameo as themselves—Manera instead tries to build the movie’s case by inverting the imagery, dressing the capitalists in the finery of the working class, and vice versa. The viewer knows Galt’s billionaire bunch are good guys because they wear flannel everywhere, drive pick-ups, like their eggs scrambled, and cook their own meals. The socialists and union leaders are bad guys because they dress in suits and ties, dine in restaurants and hotels, eat their hardboiled eggs with an egg cup and spoon, smoke cigars, and drink scotch. In other words, because they look exactly like the popular image of the wealthy. (The scotch glasses are ubiquitous, though it appears no one involved in the production has ever heard of a coaster.) These caricatures of greed and privilege would seem hackneyed in silent-era Soviet agit-prop. Atlas Shrugged, Part III’s reliance on them speaks volumes about how desperate the movie is to make a point, and how bad it is at doing that.